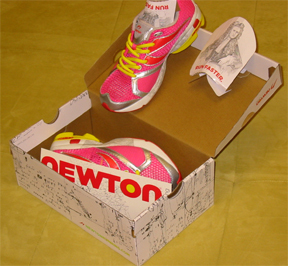 We’d like to introduce the Newton Running Shoes to our Barefoot Running Shoes products. After doing some more research about the shoe, we feel that the shoe and the technology behind it can benefit runners greatly. We will do a thorough review once we receive our pair of Newtons. For now, here are some features, information and tips as well as expectations related to the Newton Running Shoes. One truly effective method of preventing running injuries is to run correctly and to strike the ground properly using your midfoot/forefoot instead of the heel. Newton shoes train your feet to do just that. For more information about each individual shoe, please check out our Newton Running Shoe section. I was gonna ask for these shoes as a christmas prez…but after seeing how expensive they are im gonna have to pass :(. I can find shoes way cooler and way cheaper somewhere else. @me would be great to hear what shoe you would recommend!